On this 10-day trip, immerse yourself in Bhutan’s culture and history, and enjoy all the natural beauty the country has to offer. Visit Bumthang, one of the most spectacular valleys in Bhutan, and also the heartland of Buddhism. 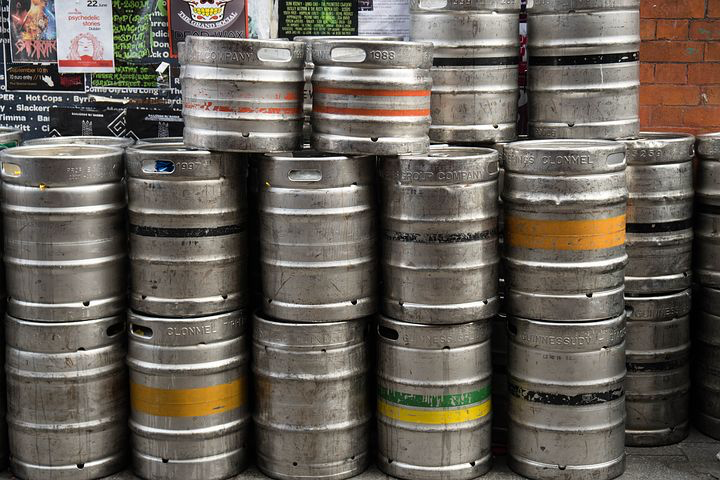 Explore the remote Tang Valley, and try some local beer at the Red Panda Brewery in Bumthang. Enjoy a traditional meal at a traditional Bhutanese farmhouse in Paro. 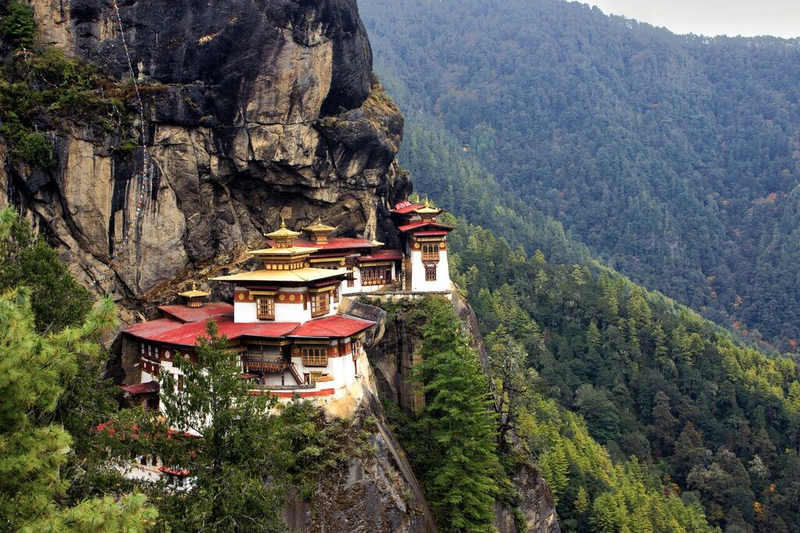 Hike to the famous Tiger’s Nest Monastery, located on a sheer cliff 900m above the valley. Throughout your journey, enjoy the comforts of your well-appointed accommodations. Your journey begins with the most spectacular view of all mountain flights. You will fly over the southern hills, known as ‘dwars,’ or gateways into the Himalayas as they rise from the plains until they meet the magnificent snow-capped peaks of the inner Himalayas, that rise up to the sky. Upon arrival at Paro airport, and after completion of airport formalities, you will meet your representative (Guide). 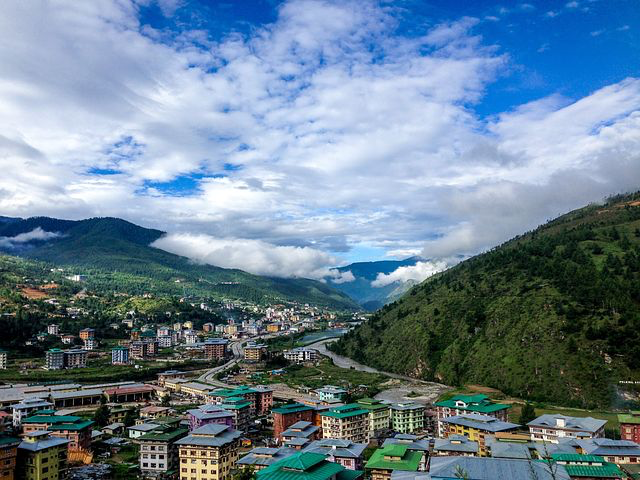 You will then be driven from Paro to Thimphu, the modern capital town of Bhutan. Have lunch at a local restaurant, and enjoy the rest of the day at your leisure. Why not take a stroll through this lively town that reveals an exciting combination of tradition and modernity. Enjoy dinner at the Durk Hotel tonight. Fuel up with breakfast at the hotel, and get ready for an eventful day in the once known only capital city without traffic lights! It still remains to be one of the cultural capitals of the Himalayas. Thimphu’s charm comes not only from its wealth of museums or places of historic interest but also from the strong national character of its architectural style. The Folk Heritage Museum, a restored mid-19th-century house which gives one insight into the average household & lifestyle in the region during that era. Visit the Institute for Zorig Chusum (commonly known as the Painting School), where a six-year training course is given in the 13 traditional arts and crafts of Bhutan. The Weaving Center, where you will be able to actually see the traditional weaving process and interact with the weavers. See Thangtong Dewachen Nunnery; the only nunnery in the Capital, it is popularly known as Zilukha Anim Dratshang. Located a few minutes’ drives from the town. It was built in 1976 by Drubthob Rikey Jigdrel (the 16th emanation of Thangtong Gyalpo who built temples and iron chain bridges). Here you may interact with some 60’s nuns who have devoted their lives to spirituality and Buddhism too. Later, visit Memorial Chorten. 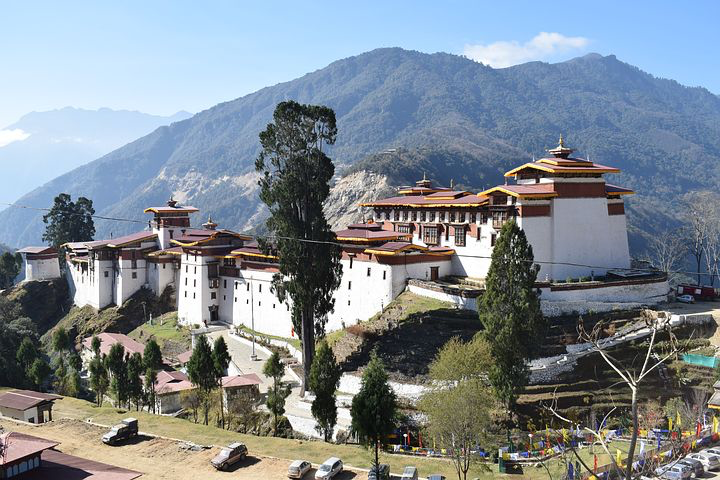 The building of this landmark was originally envisaged by Bhutan’s third king, his Majesty Jigme Dorji Wangchuck, who had wanted to erect a monument to world peace and prosperity. Completed in 1974 after his untimely death. It is both a memorial to the Late King (“the father of modern Bhutan”) and a monument to peace. Weaving Center, where you will be able to actually see the traditional weaving process and interact with the weavers. Lastly, visit the traditional Handmade Paper Factory, witness the process from start to finish. The paper is made from the barks of the black Daphne tree. The thicker paper is used for scriptures and the thinner ones are used for wrapping gifts and various other purposes. Enjoy lunch at a local restaurant, and Dinner back at the Druk Hotel. Set off for Punakha; driving up to Dochu-la pass (3,088m/10,130ft). Briefly stopping here to take in the view, and admire the chortens, Mani walls, as well as the prayer flags, which decorate the highest point on the road. 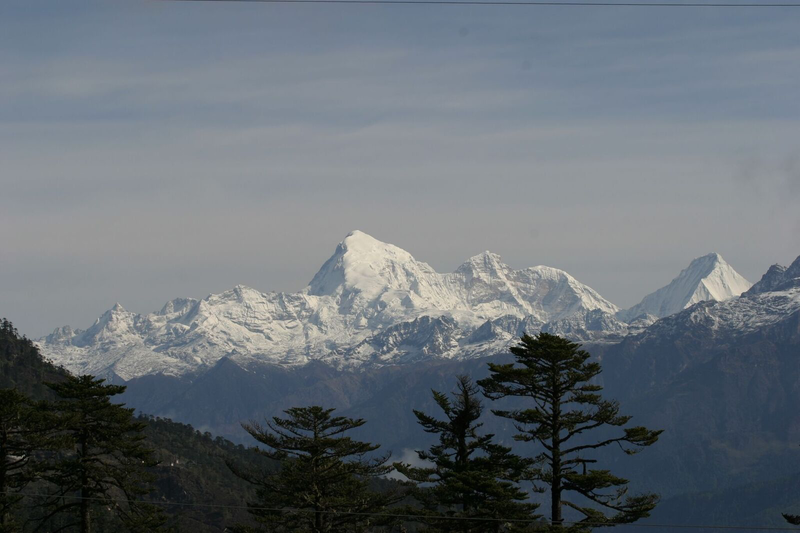 If skies are clear, the high Himalayan peaks towards the northeast will be revealed in all their glory. Punakha is located in a sub-tropical valley, and as served as the capital of Bhutan until 1955, when the seat of government moved to Thimphu. 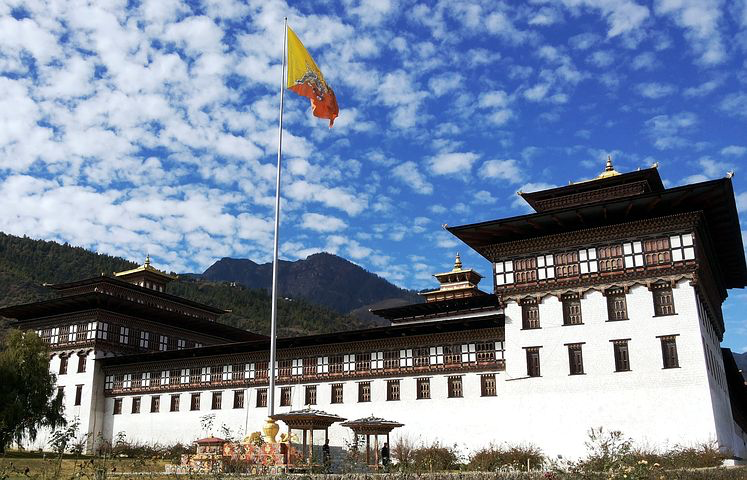 While in Punakha, visit Punakha Dzong fortress which was built in 1637, by Shabdrung Ngawang Namgyal. It was built to serve as the religious and administrative center of the region. 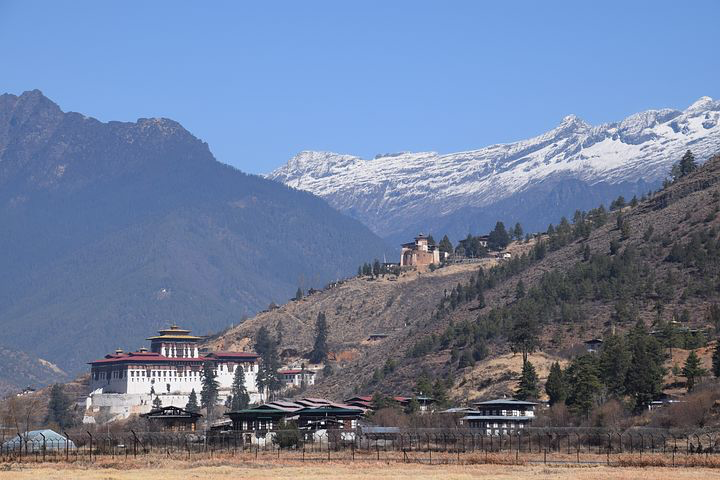 Damaged over the centuries by four catastrophic fires and an earthquake, the Dzong has been fully restored in recent years by the present monarch. The Dzong is placed strategically at the junction of the Pho Chu and Mo Chu rivers. Take in the view at your leisure, the rest of the day is yours. Enjoy lunch at a local restaurant, or one of the many cafès in Punakha. Dinner will be served back at the Kunzangzhing Resort. Have breakfast at Kunzangzhing Resort, and get ready for a memorable drive to Bumthang Valley (8hrs/257kms). 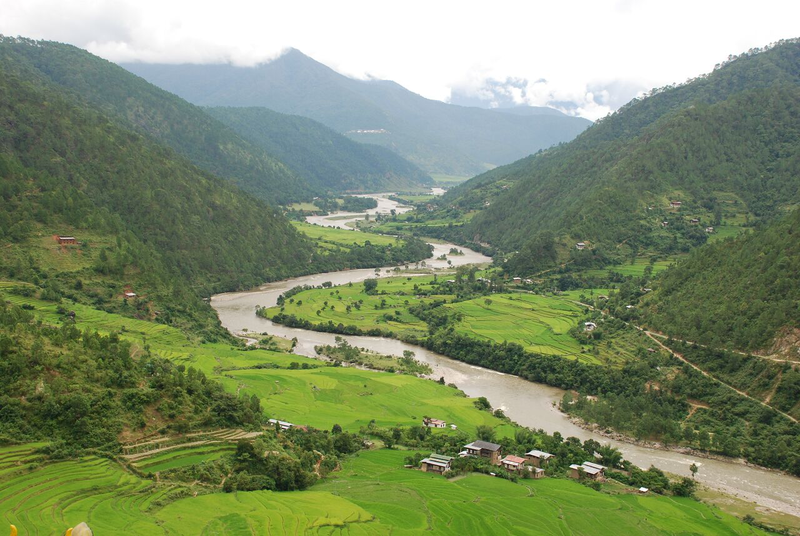 Today’s journey onward to Bumthang via Trongsa may be long, but it is indeed memorable, with its dramatic landscapes of terraced farmland, deep river valleys, and precariously perched farmhouses. These are all viewed from the only east-west highway which happens to be carved out of the mountain face. The drive to Trongsa takes you across the Black Mountain Range, that divides western and central Bhutan. You will drive up winding mountain roads through oak and rhododendron forest and across the Pele-la pass (3,300m/10,830ft). The landscape around Trongsa is spectacular and its impressive dzong, stretched along a ridge above a ravine, first comes into view about an hour before the winding road suddenly leads you into the town. The drive onward to Bumthang takes you over the picturesque Yotong-La Pass (3,400m/11,155ft), and down into the Chhume Valley. Chhume Valley is home to Bhutan’s famous Yatra weaving. Here you will have a chance to browse the traditional textiles, and perhaps see the weavers create their intricate handiwork. Enjoy the rest of the day at your leisure. Have lunch at Aman Bumthang, or a local restaurant! Later you can enjoy dinner at Aman Bumthang. You will do a walking pilgrimage of the three temples: Jambey Lhakhang, Kurje Lhakhang, and Tamshing Lhakhang. Enjoy your morning breakfast at Aman Bumthang, and get ready to explore Bumthang. Bumthang is the general name given to a group of four valleys – Chumey, Choekhor, Tang and Ura, with altitudes varying from 2,600 to 4,000m (8,530-13,125ft). This area is home to many ancient Buddhist temples and monasteries. You will have a walking pilgrimage of the three temples: Jambey Lhakhang is one of the two oldest in Bhutan (the other being Kyichu Lhakhang in Paro). It was erected by the Tibetan king Songtsen Gampo in the 7th century and is one of the 108 temples built by him throughout Tibet and the Himalayas to overcome a giant demoness. Jambay Lhakhang is placed on the left knee of the demoness while Kyichu in Paro is on the left foot of the demoness. Kurje Lhakhang comprises of three temples. The one on the right side was formed in 1652 against the rock face, where Guru Padmasambhava meditated in the 8th century. The temple in the middle was built on the site of a cave containing a rock with the imprint of the Guru’s body and is therefore considered to be holy. Continue on foot from Kurjey Lhakhang across a suspension bridge through small villages and farmlands. Arrive at Tamshing Lhakhang, founded in 1501 by Pema Lingpa. There are ancient religious paintings around the inner walls of the temple, which have been restored from the end of the 19th century. Lastly, visit the Red Panda Brewery and Cheese factory (both Swiss Bhutan collaborations) and sample the locally produced beer and cheese! Enjoy the rest of the day at your leisure, with lunch and dinner provided at the Aman. Today you will explore the stunningly beautiful Tang Valley. This seldom visited valley offers a treat in revealing some ‘off the beaten track’ lhakhangs (religious structures found throughout the Himalayas), monasteries, and the fantastic museum at Ugen Chhoeling Palace. A short hike takes you up to this well maintained Palace to a cultural treasure inside. Along the way, you will stop to visit Mebartso “Burning Lake.” Mebartsho is not a lake but a gorge in one of the rivers that run through Tang valley. Visitors and pilgrims offer lighted butter lamps on the water. Here you will enjoy a packed, lunch picnic. Later, dinner at Aman Bumthang. Have breakfast at Aman Bumthang. After breakfast, drive back to Punakha Valley (8hrs, 257kms). Proceed to Punakha and en route visit Trongsa Museum. Housed in a watchtower, and built to defend this dzong. The museum is dedicated to the Monarchs of Bhutan, and it showcases the history of its kings. You will then drive on through the mountains, and down to Punakha. Once you have arrived the rest of the day will be at your leisure. Enjoy dinner at the Kunzangzhing resort. Have breakfast at Kunzangzhing Resort. Proceed to Paro once again crossing over Dochula Pass. We will have a traditional lunch at a traditional Bhutanese farmhouse. After lunch, you will visit the auspicious Kyichu Lhakhang, a sacred monument pinning down the left foot of a treacherous ogress. This is one of the oldest temples in Bhutan, dating back to the 7th century (the other being Jambey Lhakhang in Bumthang). Rest of the day is at your leisure, enjoy dinner at Bhutan Spirit Sanctuary. Early breakfast at Spirit Sanctuary, then take an excursion to Taktsang Monastery, also known as Tiger’s Nest. It is believed that Guru Rinpoche, the founding father of the Bhutanese form of Mahayana Buddhism, arrived here on the back of a tigress and meditated at this monastery. The main structure was severely damaged by a fire in 1998, but after many years of painstaking restoration work, the complex has now been fully restored to its former glory. Enjoy at your leisure, have lunch at a local restaurant for your last day in Bhutan or have lunch and dinner back at Spirit Sanctuary. 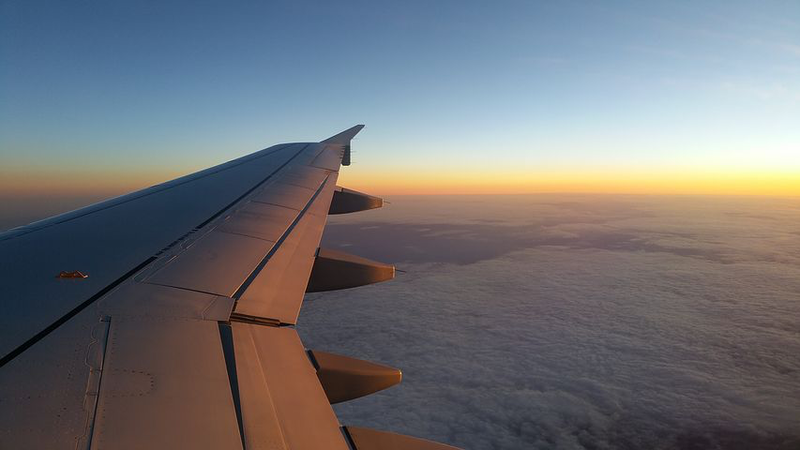 After an early breakfast at the hotel, drive to the airport for your flight to your onward destination. This 4-star Hotel features a fitness center and a bar in Thimphu. Each accommodation at the 4-star hotel has mountain views and free WiFi. Every room includes a balcony with city views. This property is centrally heated and cooled. The units in the hotel are fitted with a kettle. Rooms include a private bathroom with free toiletries, while some rooms have river views. All units feature a wardrobe. Guests can grab a bite to eat in the in-house restaurant, which serves Indian, Chinese, Continental, and Bhutanese food. 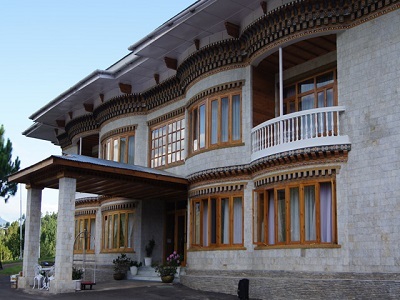 This property also has one of the best-rated locations in Thimphu! Guests are happier about it compared to other properties in the area. 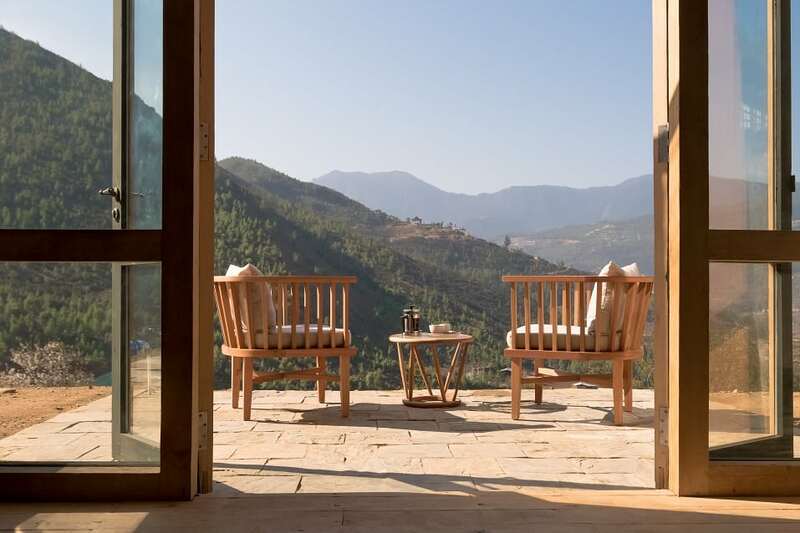 Kunzang Zhing is a 4-star Resort in Punakha valley wears a contemporary and elegant look alongside traditional architecture where traditions blend with 21st-century progress and a fascinating landscape. The stone crafts on the structures are intricately chiseled by local stonemasons, exuding the beauty from the use of local building materials and promoting the craftsmanship of local stonemasons. It overlooks the magnificent view of the paddy fields and the Puna Tshang Chhu River. The view of the mountains, blue skies, and rivers give it an exquisite feeling. The luxury resort features the very latest design trends, guest amenities, and services. The resort offers the highest level of service and indelible guest experience. Amankora Bumthang lies within the town of Jakar in the Choekhor Valley and is adjacent to Wangdichholing Palace. The 5-star, 16-suite lodge is surrounded by an apple orchard and features pear trees along its boundary with the Palace. A dzong-inspired hallway at the lodge’s entrance opens onto a Library and a comfortable Living Room appointed with lounge chairs, daybeds, and a traditional Bukhari. Floor-to-ceiling windows offer views of a landscaped courtyard adjoining the shared Palace grounds. Adjacent is the regally-appointed Dining Room with its soaring ceiling. Outdoor dining areas under the shade of local fruit trees are also provided in the courtyard. The Spa, located just above the entranceway, offers three intimate treatment rooms, a steam room, and changing areas. With the opening of its doors, the sanctuary introduces the world of travel to a new brand of hospitality, dubbed Inspirational Hospitality. This 5-star sanctuary connects their guests to the essence of the destination and guiding them in the journey to a restful mind, the aim is to help create a lasting positive change in the daily lives of its guests. The Sanctuary is located in the beautiful Neyphu valley of Paro. “Neyphu” translates roughly to ‘a gateway to secret places’ and that is exactly what Bhutan Spirit Sanctuary offers its guests; a gateway to the discovery of self and the essence of Bhutan, all in restful and luxury surroundings. With its nearly 1-meter thick walls and its courtyard the Sanctuary has an architecture inspired by the traditional Bhutanese Dzongs (fortresses) and monasteries. With the planned construction of traditional but luxury ‘mud houses’ as an additional guest accommodation option the experience of Bhutanese traditional architecture will be taken to the next level. 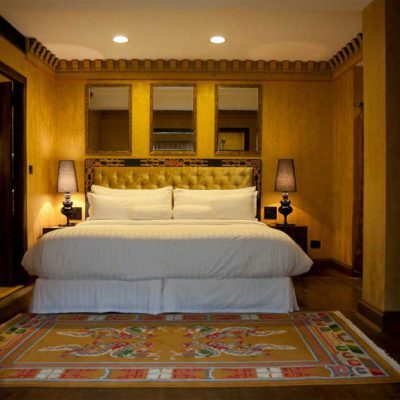 In keeping with the traditions of the Bhutanese people and Buddhism, the layout of each room is designed to respect the local culture while also maximizing the stunning panoramic views of the valley and the historic Eutok Samdrupcholing monastery. Beds are positioned so feet do not face the monastery – which is considered unseemly – and each room also has an apple tree, bench, and a book to invoke inspiration.